Solaire warmly welcomes cruise passengers with the opening of its luxury cruise center in 2021. Adding to its list of “firsts”, this new addition will make Solaire the first integrated resort in the world to have its own cruise port. Offering a strategic location, Solaire Cruise Center Manila will set the tourism spotlight on the Philippines as it provides the cruise industry with state-of-the-art marine and terminal facilities. 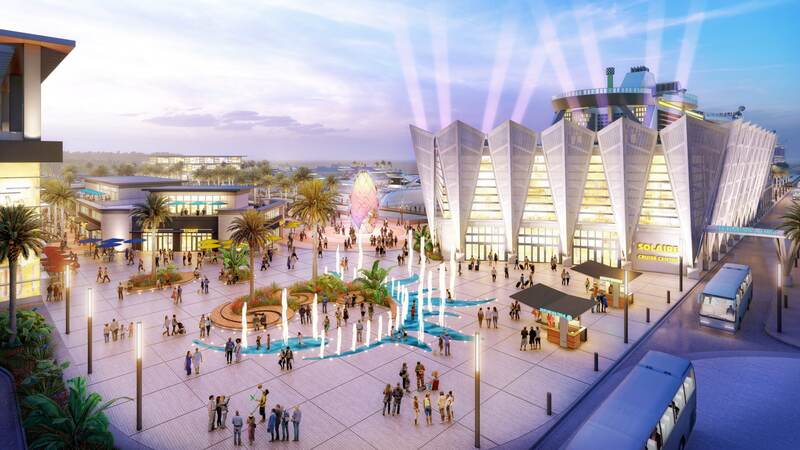 In addition, the cruise center is also beautifully designed to seamlessly blend with Solaire’s expanded harbor, offering the best in shopping, dining, entertainment, and maritime recreation amidst verdant esplanades and plazas that guests of all ages will enjoy. Enjoy all the best that life has to offer as Solaire expands its lifestyle offerings with the construction of the Solaire Cruise Center Manila. A first in the world. This luxury cruise center within an integrated resort concept is a first in the world. Coming in 2021, The Solaire Cruise Center will be the region’s premier marine leisure gateway, linking Manila and the Philippines to the world. The $308-million project is under Sureste Properties Inc., a subsidiary of Bloomberry Resorts Corp., which also handles Solaire Resort & Casino in Manila. The luxury cruise center is seen to put the Philippines on the map as a tourism hub, enticing more tourists to come in while opening up more work and investment opportunities for the country. * 15 minutes from the airport and 30 to main area sights and attractions including luxury shopping destinations and one of the largest malls in Asia, historical sites and monuments (Cultural Center of the Philippines, National Museums, Corregidor Island), etc. Since 2012, Asia-Pacific cruise capacity grew 240%. Today, international and regional lines operate over 80 vessels. In the coming decade, Asia-Pacific region passenger growth is expected to reach 8 million guests, a level that necessitates increases in the number and quality of ports and destinations. The Philippine archipelago hosts Manila and 16 other current and potential cruise destinations. As these are developed and expanded, the potential exists to create a stronger market desire for itineraries embarking from China and Southeast Asia that take in more than one port. The possibility of Philippine-centric cruises embarking seasonally from Manila also holds long term promise. Manila and the Philippines are well positioned within the Asia-Pacific region to support cruise homeport and port-of-call operations. These locations support itineraries between 5- and 7-days that link international ports and destinations in Taiwan, Vietnam and China. It is in line with Solaire’s mission of becoming a globally preferred luxury brand while maintaining its lead as being a true visionary in being the first to deliver truly world-class experiences to its guests. 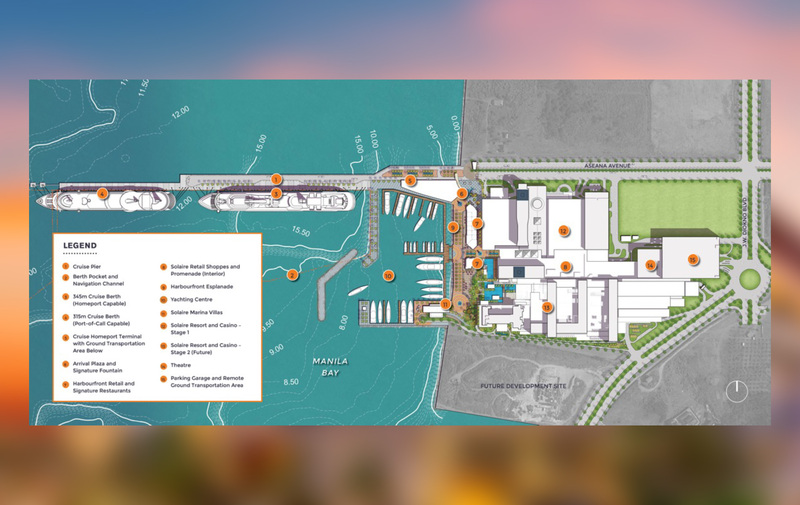 Construction for phase one will begin Q3 of 2019, and will create room for two mega-size cruise ships simultaneously in a linear berth configuration. There will be one berth for vessels that are up to 365m in size, while the other one will be for ships up to 345m in size. 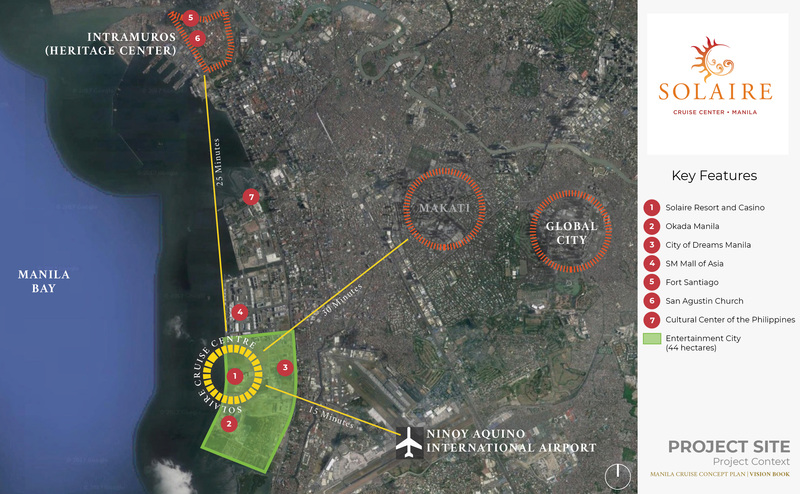 It will also have a cruise terminal building, which aims to establish Manila as major homeport and port of call in the region. This market is expected to grow rapidly fueled by increasing tourism into the country and Solaire Cruise Center’s proximity to Ninoy Aquino International Airport, which will boost the development of the fly cruise segment within the Philippines and around Asia. Construction is expected to be completed within 18 to 24 months, with the cruise center becoming fully operational by Q3 2021. 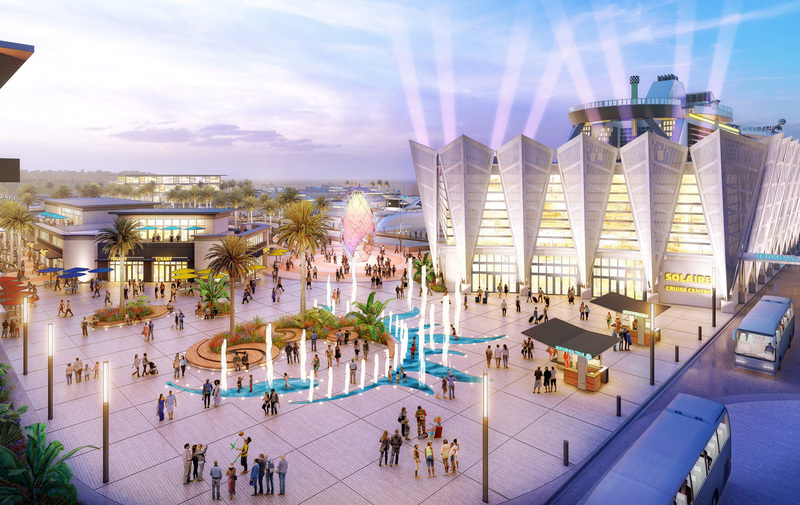 More than just a cruise center, this new project will also be filled with numerous lifestyle attractions for guests. 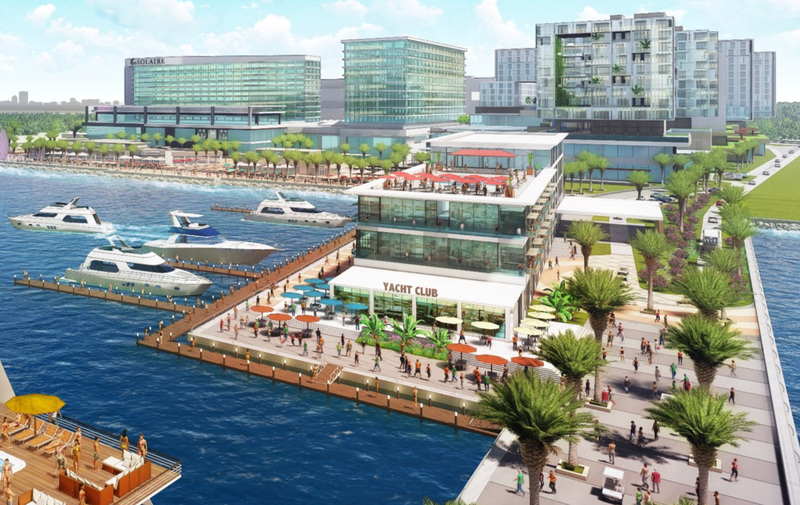 An upscale marina and yacht and charter boat facilities will also be constructed along with verdant spaces, esplanades, and plazas that offer the finest in dining, shopping, and entertainment. Why open a cruise center at Solaire? As the country’s first Filipino-owned luxury integrated resort, Solaire has made it its mission to continue coming up with one-of-a-kind experiences for its guests. Elevating the way they enjoy shopping, dining, entertainment, and leisure, Solaire Cruise Center Manila is a welcome addition to the Philippines’ multi-awarded, 5-star integrated resort. Located in the ever-growing Entertainment City – Asia's answer to Las Vegas, Solaire also has great road connectivity making it ideal for business and leisure travelers. With the creation of the cruise center, not only will Solaire be able to boast of great accessibility to and from the airport, but its new facilities enable it to have an easy link to a network of emerging destinations throughout the Philippine archipelago. 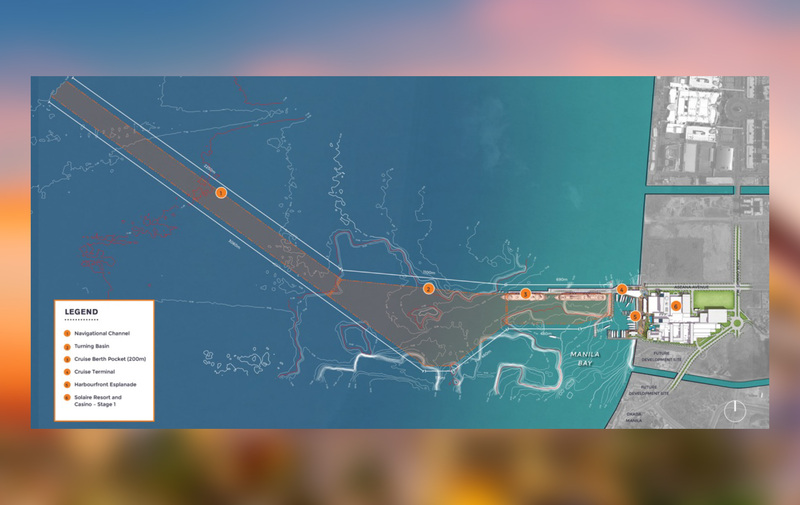 Has construction for the cruise center already started? 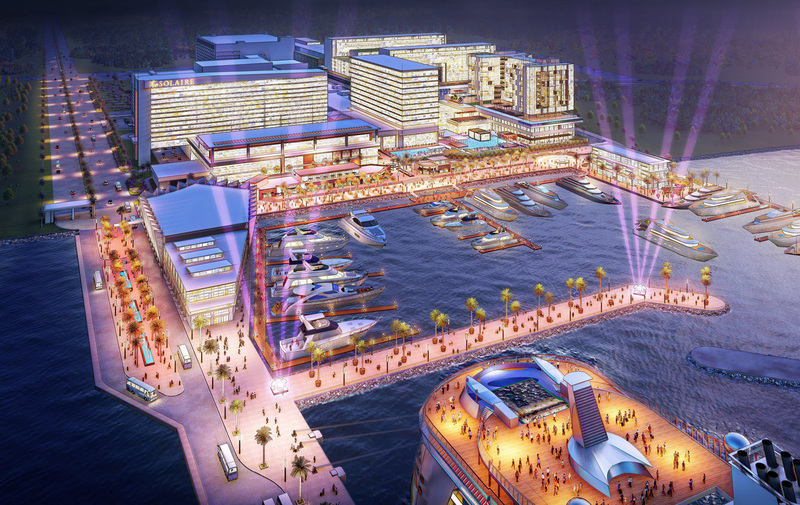 Construction for the cruise center will begin in Q3 of 2019 and is expected to be completed in 18 to 24 months. When will Solaire Cruise Center Manila open? 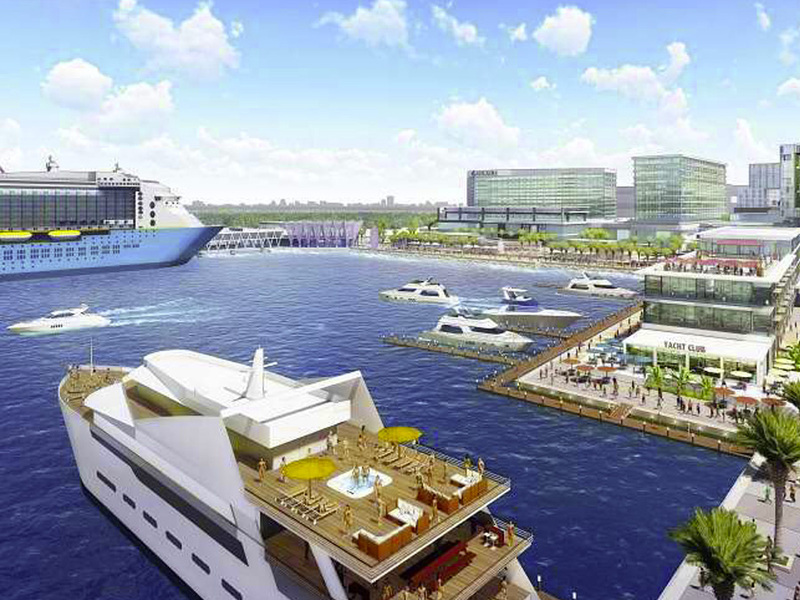 Solaire’s new luxury cruise center will open in phases. 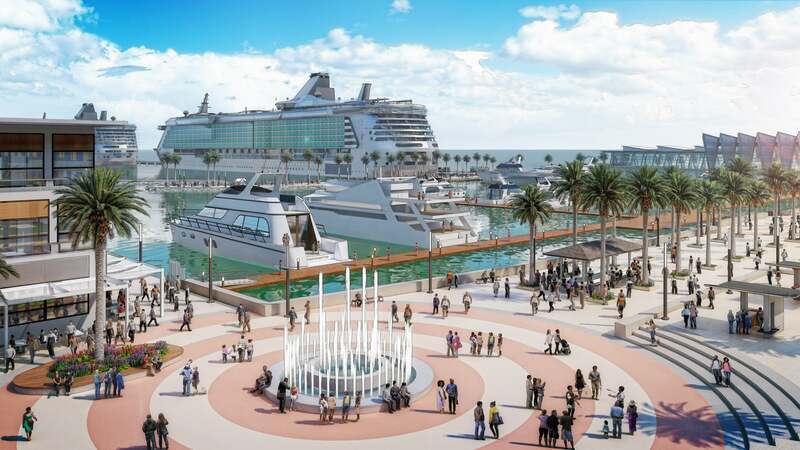 The first phase will open in 2021, and will be more focused on the main navigation of the Solaire Cruise Center and the construction of the berth of the homeport. It will also have a terminal building which will handle the homeporting of one large ship – with a capacity of 3,000 to 4,000 passengers, over an 8-to-10-hour interval. It is expected to become operational by Q3 of 2021. How many ships can the cruise center accommodate? 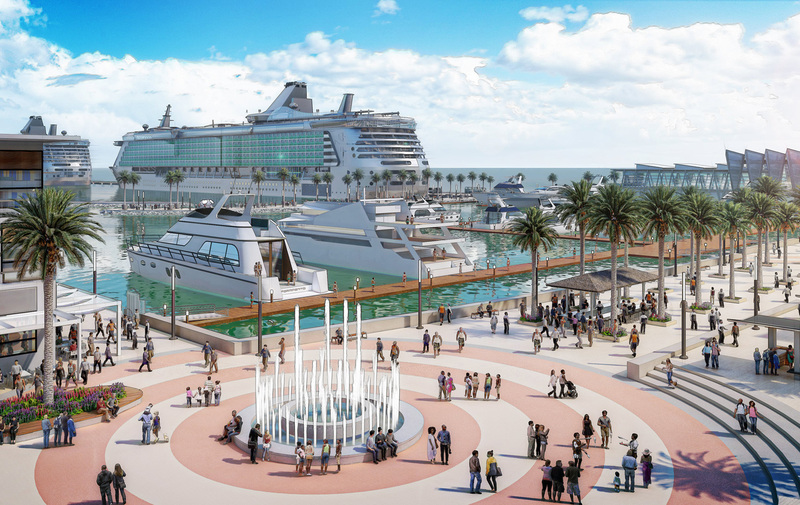 For phase one, the pier will be able to accommodate the largest cruise ships in the market currently. There will be one berth for vessels that are up to 365m in size, while the other one will be for ships up to 345m in size. What are the other facilities of the cruise center? 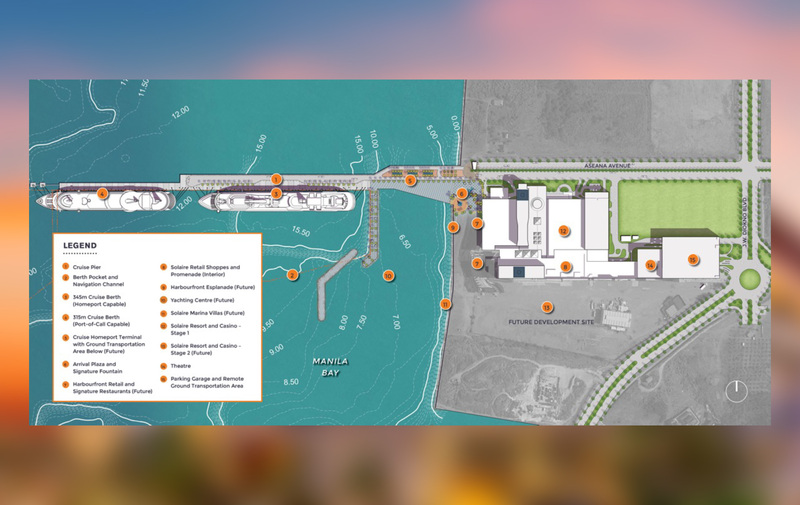 There will be a staging area for buses, e-hailing, and passenger transportation while the homeport facilities will provide check in, luggage, provisioning capable berth and security. 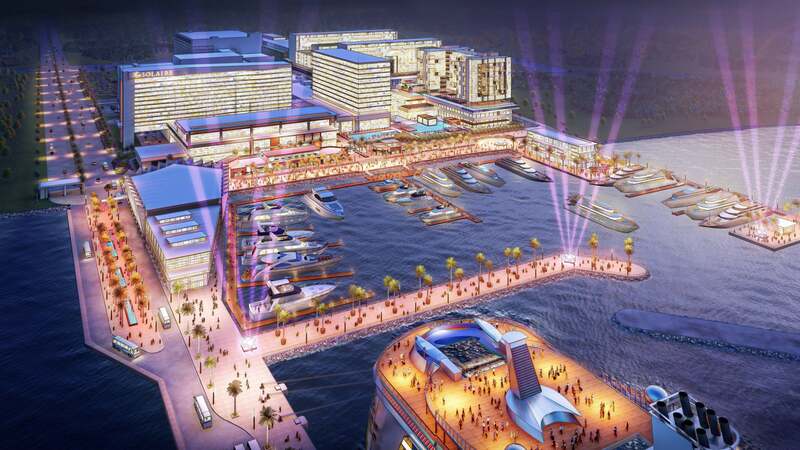 There will also be a luxury marina and charter boat facilities as well as verdant areas, esplanades, and plazas which will include shopping, dining, and entertainment attractions. or call thru +63.2.888.8888 .